Awesome card just love the colors! My daughter would FLIP for this! So cute! So happy to be in this hop with you! Cute card! I love that card shape...going to have to try it out! Fabulous card! I love skulls too! How cool is that??? I love all the fabulous mats behind the skull... so many layers...love it! I love the color combinations! The different shapes are a nice touch. TFS and the chance to win! Scrappy hugs my dear. LOVE pink and black. Love the card, very punk! Great shaped card! I love all the added embellishments and the paper combinations rock! Looks great! Love the colors that you used! The card is really cute! How cool is this great job. thanks for sharing and for the chance to win. I love the pink and black theme too! 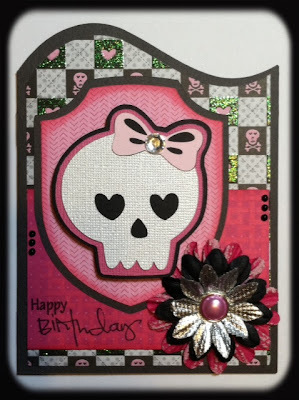 Great job on your card, love that skull!! This card turned out great! Super colors and love the details. Love this card! I have all these carts and would never have thought to put these cuts together. Thanks for sharing and the inspiration! Thanks for the hop..love them. This is awesome, love the papers you used. Love it! And I am def. loving the cuts from that cartridge! I think I need it, hehehe! Thanks so much! Cute Card! I love the pink and black together! I love your card. It's adorable. Who would think that punk could be girly... thanks for sharing. Skulls are my favorite! I love the paper you used and the black and pink combo rocks! Love this card Candace! My girls would fight over it :) That color combo is one of my favorites. Awesome job with this card! Everything is just perfect! Love the pink colors on this card! Super adorable! Cool card! Thanks for the inspiration. Cute card! My sister would love it, super cute for a bday around Halloween! I love your card and the colors. Great job. That is such a cool card. Love how you made it girly with the heart eyes ad pink bow! Very cute card! love black and pink. Pink and black are great together! Cute Cute Cute! Thanks for sharing! I love your card!! !, Great now i have another cart i have to put on my list to buy. adorable. love the fun colors. Super cute card. I love the flowers! TFS! Cute Card! It is adorable! Love the colors. TFS! Nice design.Love the convination of the colors. Muy original tu tarjeta, felicitaciones!!!! de verdad, me encantó!!! Well, isn't this just the cutest?! My kind of girly card! Very pretty card. I just love how you made this skull "cool". Thanks for sharing!